In a landmark civil rights decision, the Connecticut federal District Court established for the first time that consumer reporting agencies must comply with the Fair Housing Act when conducting tenant-screening services for landlords. The decision in Connecticut Fair Housing Center et al. v. CoreLogic Rental Property Solutions, LLC, which the Center filed with the National Housing Law Project after CoreLogic’s tenant screening product, CrimSAFE, disqualified a disabled Latino man with no criminal convictions from moving in with his mother. CrimSAFE provides landlords with an accept or decline decision based on CoreLogic’s assessment of an applicant’s criminal record. The lawsuit alleges CrimSAFE discriminates on the basis of race, national origin, and disability in violation of the Fair Housing Act. 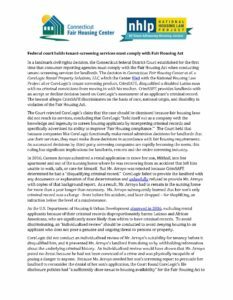 The Court rejected CoreLogic’s claim that the case should be dismissed because fair housing laws did not reach its services, concluding that CoreLogic “held itself out as a company with the knowledge and ingenuity to screen housing applicants by interpreting criminal records and specifically advertised its ability to improve ‘Fair Housing compliance.’” The Court held that because companies like CoreLogic functionally make rental admission decisions for landlords that use their services, they must make those decisions in accordance with fair housing requirements. As automated decisions by third-party screening companies are rapidly becoming the norm, this ruling has significant implications for landlords, renters and the entire screening industry. NHLP has updated its litigation webpage.